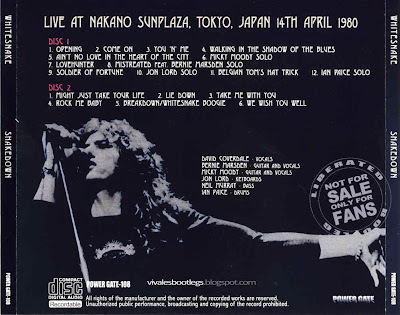 Recorded Live at Nakano Sun Plaza, Tokyo, Japan - April 14, 1980. EX/VG+ Audience Recording :: Japanese CDR Bootleg :: CBR 320 kbps. Files: 18. :: Size: 242,54 MB. Personnel: David Coverdale :: Neil Murray :: Micky Moody :: Ian Paice :: Jon Lord :: Bernie Marsden. Notes: First An Apology. I Uploaded This Boot In 2007 With A Wrong Date As Tokyo 1980-04-15. 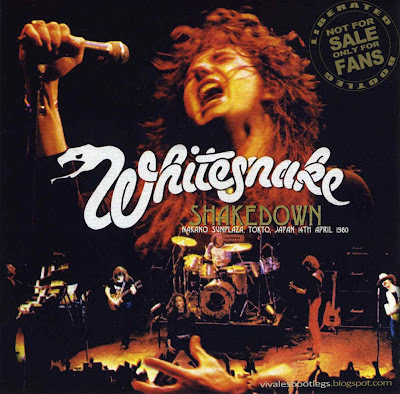 At That Time Two New Silver Boots From The Tokyo 1980 Shows Were Released, "shakedown" From April 14th And "sing For Me Tokyo" From April 15th. Shakedown Was Exactly The Same Show As The "tokyo Bites" Boot (Only A Different Source), That Had Been Circulating For Years With A 1980-04-15 Date And "sing For Me Tokyo" Was A Different Show. So I Thought That The New Boots Were Labelled Wrongly. But Last Year Another Boot "tokyo Choir" From 1980-04-15 Appeared, Being From The Same Show As The "sing For Me Tokyo" Boot. Considering That "tokyo Bites" Originally Only Claimed To Be From Tokyo 1980 (Just The "rock Me Baby" Silver From The Same Source Explicitely Said April 15th) I Now Believe That Someone Made A Mistake Back Then Giving These Boots A 1980-04-15 Date And That All The New Silvers Have The Right Date.<-(Info taken from original nfo file). Thank you so much! Great sound, especially the voice is very clear in the mix. Fantastic show, interesting to compare it to the London June shows used for the official live. I'd say Mistreated is even better than the 1978 version used for the official one. Good to hear You'n'me played live.